Originally, researchers led by Sabine Costagliola, PhD, the Free University of Brussels, intended to study thyroid physiology by deriving thyroid cells from stem cells; but, surprisingly, the generated thyroid tissue spontaneously formed three-dimensional follicle-like structures in vitro. 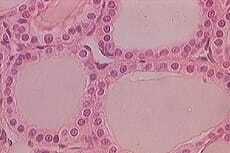 The scientists grafted this tissue into thyroid-less mice, which resulted in rescued hormone levels. This study is published in Nature.